Help! My cat is stuck in a tree! 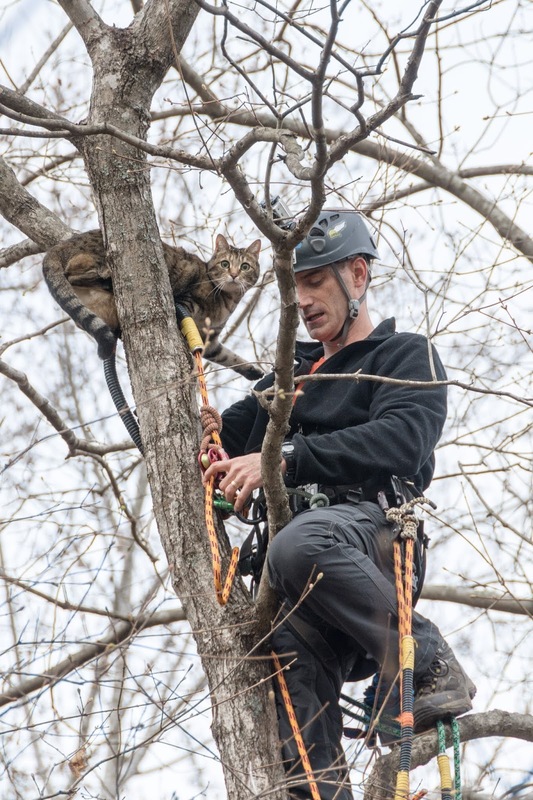 If your cat is stuck in a tree and can't make its own way down, I'm happy to bring him or her safely back to your family. I suggest giving your feline friend 24 hours to come down on his or her own before calling me. Many cats will figure out how to get themselves down in that amount of time. 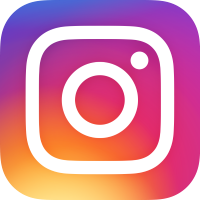 Take a look at the "What you can do on your own" tab for suggestions of what to try before calling. However, if the weather is particularly harsh, if you are worried about your cat's safety, or if your cat has been up there for more than 24 hours, please call, text, or email me. Leave me a voice message if needed, and I will get back to you promptly. It is also helpful, if you can, to email me a picture of the cat in the tree. Where will you do rescues? I regularly perform rescues in Durham, Orange, and Alamance counties and I am willing to travel to neighboring North Carolina counties as well. You can call me for recommendations of other cat rescuers if you think you are out of this area. I am on call with Durham, Orange and Alamance County Animal Control Divisions. Is this going to damage my tree? 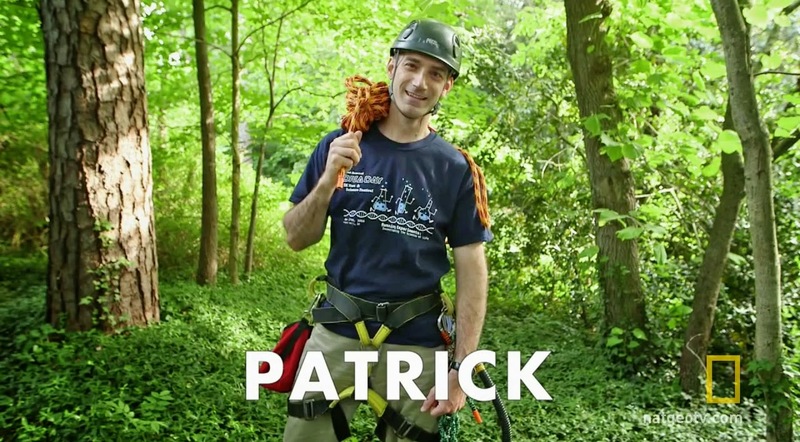 I use safe, OSHA-approved, professional tree climbing practices that won't harm your tree. I'll never use climbing spikes because they can introduce insect and fungal diseases into an otherwise healthy tree. Phone consultations are always welcome so give me a call if your cat is stuck in a tree and you're not sure what to do. If you decide a rescue is needed, I appreciate a donation to help cover my gas, time, and gear costs. However, thanks to our donors, I have never turned away someone in need because of an inability to pay. I have a ________ stuck in a tree. Can you help me? Feel free to contact me to rescue cats, birds, and other pets, expensive toys such as model airplanes, drones, rockets, helicopters, etc. I'm a dad with 3 kids, a wonderful wife, and two indoor cats - Snowy and Heber. Most of my family also likes swinging and climbing in the trees with me. My day job is in higher education administration. I love being outside in nature and I have a special place in my heart for animals - especially helpless, stranded ones. 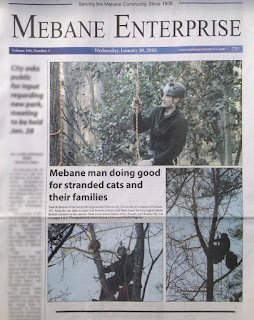 Check out this front-page article in the January 20th, 2016 Mebane Enterprise about the important service RescueMyCat.org provides. Please download and share our 2015 RescueMyCat.org flyer with your vet, your kitty-loving organization, and like minded friends. Want to learn to climb trees? Receive an email when we add a rescue story!